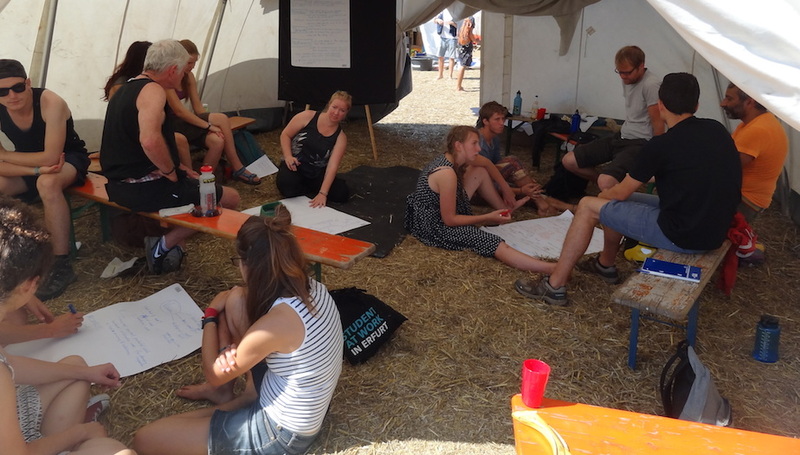 As activists gear up for another Ende Gelände action in the Rhineland before the UN climate talks, Bernadette Barth and Catherine Hookes report back on the workshop on climate jobs and just transition which was held at the climate camp leading up to the action in August. On a freshly cut straw field, in the heart of west Germany, climate and environmental activists gathered to share their knowledge and skills, meet new and old friends and develop a movement. The climate camp Rhineland started in 2010 on football pitch and 80 attendees. Today it has spilled over into the field next door, and the one after that, with numbers swelling to over 6000 activists. The climate camp includes a degrowth summer school, Peoples Movement Tent, Tent of Life, workshops, and courses on wide range of topics form toxic masculinities to living without money, eco-socialism and many more issues that make up the complex process of fighting climate change and creating a sustainable, equitable society. The degrowth summer school is part of the larger degrowth movement that is gathering momentum across Europe and beyond. They understand the current economic system as destructive to the natural basis of life and see a need for a fundamental transformation of society and extensive cultural change that puts care, solidarity and cooperation at the foreground. This year the Rhineland degrowth summer school, had three themes ‘psychology of change’, ‘skills for system change’ and the ‘Degrowth perspective on the future of the Rhinish lignite region’ which included a four day workshop on ‘just transition’. Where a group of keen climate activist discussed the concept of ‘just transition’ and its relevance for the climate movement. The workshop covered the division between humans and nature, the theoretical division that places humans outside of nature and thus perpetuates the false dichotomy of 'jobs versus the environment'. Throughout the first day we explored this dichotomy, put in place by capitalist production systems, and created our own ideas of "decent work" that would reconcile social justice with ecological consideration. After having stated the "problem" and the "solution" we spent the following three days of the workshop on exploring the common grounds of the environmental and the labour movements and finding practical solutions that help us fighting a shared struggle. On the final day John Sinha and Graham Petersen of Campaign against Climate Change and Greener Jobs Alliance, were spotted from a distance arriving with ‘Time to Cycle’, to the climate camp. Though they must have been expecting a well earned day of rest, after cycling all the way from the UK, Jon and Graham agreed happily to join the workshop and provide valuable insight to the group on the practicalities of developing a decarbonising industrial strategy, such as the one Million Climate Jobs campaign. Just Transition is starting to gain traction in the climate movement. With a growing understanding that workers within carbon intensive industries will be impacted by reduction in heavy industries, alternatives have to be considered and workers are recognised as important agents within any transition. The Klimacamp organised a panel discussion “What comes after lignite? And how to pave a just way?“ where lignite miners, climate activists and local people from the region discussed the future for the region and the possibilities of demanding an ecological sustainable and secure future for the region. The panel discussion represents an important milestone on the path towards a collaboration between the union and the degrowth movement. For the first time, representatives of the mining union IG BCE and the climate camp organisers met in public, not only to discuss legitimate forms of protest action in and around the coal mines, but to pose the question on how to shape a socially just fossil-free future together. The willingness from both sides to enter the debate has to be stressed as the major outcome of the panel discussion as answers to the question of the “how to” were pushed aside by ideological divisions once again. How to overcome the deep trenches curved by a system of alienation that poses “work” and “nature” as opponents, was shown by local resident Thorsten Noll, also part of the panel, who proved that at the heart of any transition lies emancipatory action by locals who seek to strengthen their regional socio-economic structures by creating small businesses based on local needs. While the heated debate proved that a long road lies ahead for the degrowth and union movement to find common terms, a first step in the right direction was taken with this public event, which has attracted visitors and discussants from all sides who are wishing to see real alternatives to be discussed. Towards the end of the week the camp began to swell and the food queue snaked its way towards the back of the field, as activist started to arrive from across the globe to take part in the direct climate action, Ende Gelände. Ende Gelände takes its inspiration from the literal translation from German end of land, the end of the story. The broad alliance of anti-nuclear, anti-coal movements, grassroots climate action groups and networks that make up this mass civil disobedience action, have a shared believe that to stop catastrophic climate destruction, direct action needs to be taken now. In August 6000 climate activist from all walks of life stood together in a mass occupation of the one of Europe's largest emitters of carbon emission, lignite brown coal. This was the third year the Ende Gelände took direct action against coal mining in Germany, and it will continue this November. As the heads of government gather in Bonn for the 23 conference of the parties to discuss how to stabilize the climate, climate activist will be taking direct action a few kilometers away. Ende Gelände will mobilise again to demonstrating the hypocrisy of governments signing climate agreements that state there is an urgent need to reduce carbon emissions and keep global temperatures from rising above 1.5 degrees celsius, while sanctioning the continued extraction and burning of one of the most polluting and destructive of fossil fuel energy, lignite brown coal.